Bananas for Smoothies: Here Goes Nothing! Hello and welcome to Bananas for Smoothies!! I am starting this blog as a way to chronicle life as a busy 30-something wife and mom in Rhode Island. A few things about me: I'm vegan, I love to cook, I love to eat, and I love to talk about food! I also have a passion for healthy living and, above all else, bananas and smoothies. I have a smoothie for breakfast every single day and I'll often have one as a mid-afternoon snack, too. What can I say, I love me some smoothies! I'll document some of my favorite smoothie creations along with some of my typical meals and snacks to show how delicious and nutritious a vegan diet can be! 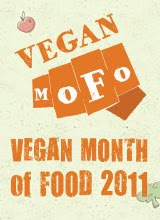 First, a little history...I've been vegan since September 2006. I like to say that I became vegan by accident! It's a long boring story, but basically, I started following a book called The pH Miracle in an effort to cure my acid reflux disease. The book recommended eating low-acid fruits, vegetables, and grains, while eliminating dairy, meat, poultry, and most fish (unless it was extremely fresh). I began following this eating plan but, even though I really enjoyed fish, I was too lazy to go about procuring extremely fresh fish. So, I realized after about a month or so that I was actually following a vegan diet! I then began to realize how much I really enjoyed it - I've always loved my vegetables, and I found this way of eating to be extremely satiating and also very enjoyable. My meals were fairly easy to prepare and I felt really healthy. I also lost some weight which I had tried, unsuccessfully, to lose many times in the past. I embraced this vegan diet and I haven't looked back! My cholesterol dropped from 235 to below 190 (I haven't had it tested recently) and I've lost 30 pounds and kept it off for over 4.5 years now. The best part is, I have learned to cook all kinds of foods and cuisines and have really expanded my palate. My goal is to show how tasty and enjoyable it can be to eat a plant-based diet!